Primary cardiac tumours are rare. We report the first known case of congenital cardiac haemangioma in Ireland. A neonate presented with symptoms arising from a congenital atrial haemangioma on day three of life. The mass was successfully excised via median sternotomy and bicaval cannulation for cardiopulmonary bypass. The patient was discharged day ten postoperatively and remained well at one year follow-up. The degree of debulking surgery required varies depending on tumour type. This report serves to aid clinicians in accurately suspecting, investigating and diagnosing patients with cardiac tumours. 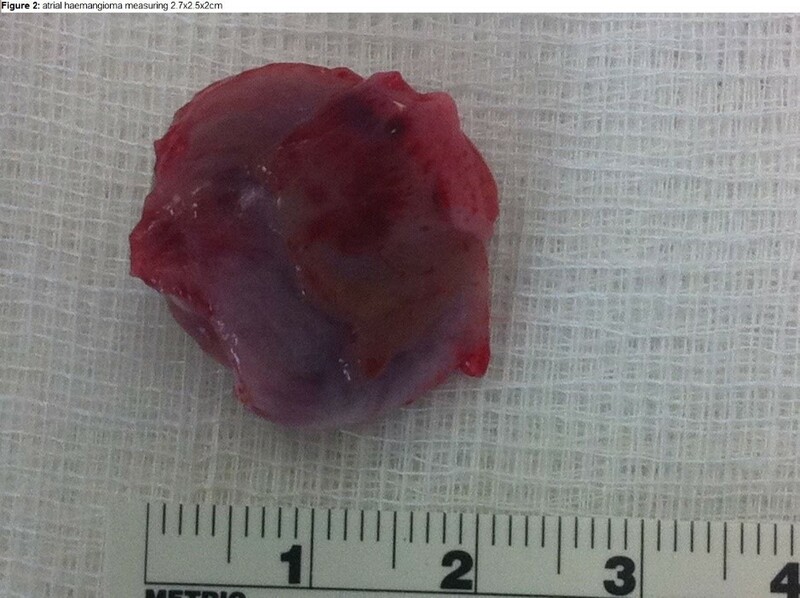 Cardiac hemangioma is a rare form of primary cardiac tumor. Only small a number of cardiac hemangioma cases have been reported in the literature and therefore appreciation of the best management strategies for primary cardiac tumors in neonates is somewhat lacking. We present the rare case of a neonate who presented with symptoms arising from a congenital atrial haemangioma on day three of life. This report serves to remind the paediatric medical community of the rare diagnosis of primary cardiac tumours, diagnostic clues and therapeutic interventions used to address this unusual diagnosis. A female neonate who was well at birth, with a weight of 2.5kg, became cyanosed during routine examination of the hip on day three of life. Oxygen saturations were noted to be 88% on room air. The neonate recovered and subsequent examination was unremarkable. No obvious congenital anomalies were noted. Further investigation with echocardiography demonstrated a right atrial intra-cavity mass occupying 80% of the atrium, which accounted for the presentation of cyanosis due to decreased venous return. The mass was noted to be 2.7x2.5x2cm with some areas of low attenuation within the mass which potentially represented necrosis on computed-tomography (CT) angiography. The lesion appeared contained within the right atrium and attached to the wall. No pulmonary or bone lesion were noted. 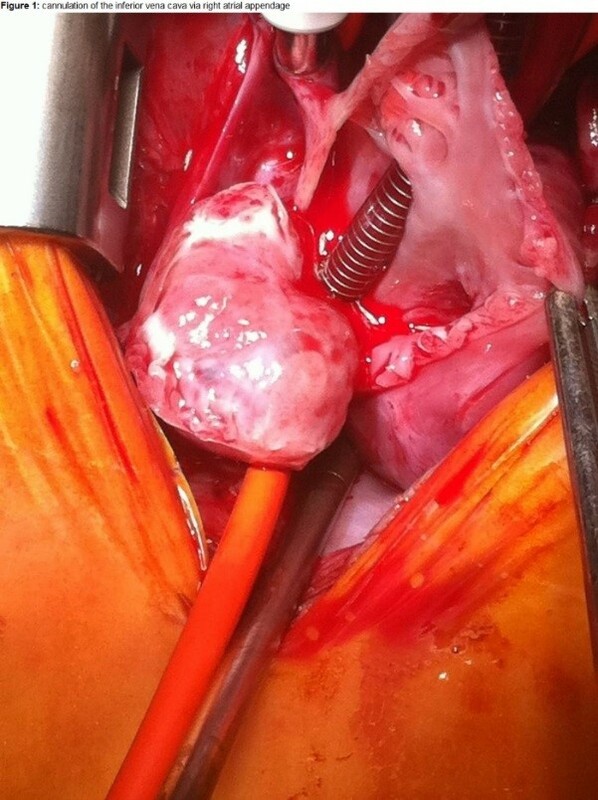 Successful surgical excision of the cardiac mass which was performed via midline sternotomy. Bicaval cardiopulmonary bypass was initiated. Notably, the inferior vena cava was cannulated via the right atrial appendage due to the large size of the mass (figure 1). Figure 1: cannulation of the inferior vena cava via right atrial appendage. The right atrium was entered via the right atrioventricular groove. On inspection the tumour appeared to extend through the right atrial wall into the pericardium. The tumour was excised in addition to a section of the lateral wall and pericardium (figure 2). Pericardial patch was used to repair the defect from resection. The tumour, a biopsy from the right atrium-inferior vena cava junction and the thymus were specimens sent for histological analysis. Figure 2: atrial haemangioma measuring 2.7x2.5x2cm. Initial histological analysis found the tumour to be a vascular neoplasm. Further immunohistochemical staining and FISH was performed on the specimen which supported the diagnosis of an atrial haemangioma. The patient was discharged well on day ten post-operatively after an uneventful course. The patient remained well and disease free during 12 month follow-up. Cardiac haemangioma (CH) are vascular in nature and therefore should be differentiated from other vascular masses including; intramuscular haemangioma, congenital haemangioma, malignant polymorphous haemangioendothelioma or vascular presentation of a myofibroblastic proliferations such as myofibroma or congenital infantile fibrosarcoma.3 The importance of establishing accurate diagnosis is critical because benign tumours may be treated with a less aggressive resection. Ultimately, the presence of a malignant tumours is associated with worse early and late survival1. Concurrent cutaneous haemangioma may suggest a diagnosis of cardiac haemangioma.4 Echocardiography and radiological features may help differentiate tumour types. CH are typically hyperechoic on echocardiography and may be shown involve the endo-, myo- or epi-cardium on CT imaging. MRI imaging may be used to further help differentiate cardiac tumours. Typical features of a haemangioma on MRI are an intermediate signal on T1-weighted imaging and a hyperintense lesion on T2-weighted imaging. Furthermore, haemangiomas are avidly enhancing on first-pass perfusion sequences and are isotense on late gadolinium-enhanced images5. Surgery is indicated for masses with symptoms, ECG changes, haemodynamic compromise on echocardiography or for locally aggressive or malignant growths. Debulking surgery with clear margins is vital to prevent recurrence. One series reports acceptable outcomes with partial resection of benign histological types of tumours such as rhabdomyosarcoma.1 In cases of relatively large or invasive tumours, heart transplantation remains an option.1 Resection is ultimately tailored to the patient but cardiopulmonary bypass and cardiac arrest is often required. Intraoperative technique must be meticulous to prevent embolization and to prevent damage to nearby structures such as the coronary vessels.